At what is known as Wigwam Point marking the entrance to Annisquam Harbor. The lighthouse is on Lighthouse Road off from Wigwam Road. Wigwam Point near the current lighthouse was once a gathering place for local Native Americans. The lighthouse was built at the entrance to Annisquam Harbor in 1801, than replaced in 1897. The first Keeper, George Day, tended the lighthouse from 1801 to 1850. He was allowed to keep a cow by the station for sometime to provide milk for his family. Rudyard Kipling stayed at the station once to work on his book, Captain’s Courageous. 1n 1890, the schooner Mexican with a cargo of coal, got caught in a September nor 'easter and wrecked about 500 feet from the lighthouse. The crew made it ashore, from the wreck, and that winter, many locals salvaged the stranded coal for their heat. In 1922, a newly developed electrified fourth-order lens was added to the lighthouse with a single light source…a 100-watt light bulb. The light could be viewed eight nautical miles out. The lighthouse is located in the middle of a small waterfront neighborhood and is off limits to visitors, especially during the summer months. If you need to get photos, plan off-season, pull over on the road, take your chances and get some images. Annisquam is located just outside the city of Gloucester. There is a beach nearby the lighthouse that provides nice views of the lighthouse, especially in the off-season. During the summer months the beach is open to residents only. Wingaersheek Beach located across the river in Gloucester, displays a nice view of the lighthouse. You can not hang out at the beach as a non-resident during the summer months. During low tide it is possible to walk a good distance from the beach to get close to the lighthouse. 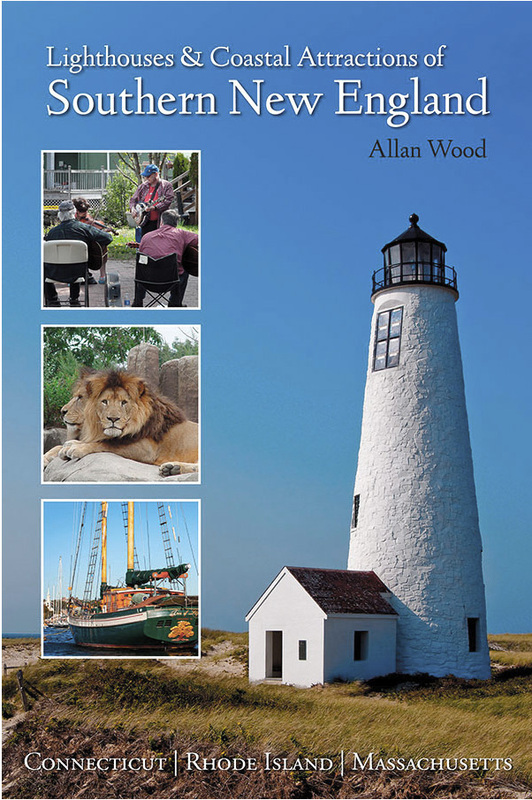 This is primarily a boating community that resides along the Annisquam River, which is a tidal, salt-water estuary in Annisquam, connecting Annisquam Harbor on the north to Gloucester Harbor on the south. Heading out of Annisquam, taking Route 133 North onto Route 1A, is the little historic town of Ipswich. The Crane Estate on Castle Hill is one of the most famous seaside estates with the mansion steeped in Italian Renaissance, and hiking trails on the wildlife refuge. There you’ll find one of the cleanest beaches, Crane Beach. It is on 1,234 acres of conservation land consisting of four miles of a long sandy beachfront, dunes, and a maritime pitch pine forest. The lighthouse property has been purchased by a new private owner who has blocked the parking lot for security concerns. The beach nearby is also private for residents only and is strictly enforced during the summer season. With these changes if you want to try to get pictures of the lighthouse from the beach side, go there during the off season. Its basically take a chance parking quickly, take a photo and drive off. There is no place to get permission. Follow Route 95 to Route 128 towards Gloucester. From the rotary at the junction of Highways 127 and 128 east of Gloucester, go north on Highway 127 (Washington Street) for 3 miles to Bridgewater Street. Left onto Bridgewater Street. Turn right onto Norwood Heights (sign) after almost a half mile. Follow this road to a fork, bearing right at the fork, crossing Ocean Avenue, keeping to the left, then turn right at the “T”, and then make a quick left onto Wigwam Road. At the end of Wigwam Road you'll see the beach area which is part of Lighthouse Road. There is a small parking area that is only for local residents in front of the tiny beach as the lighthouse parking lot is closed to the public. Use your discretion and understand you are in a private area that will not allow visitors and may find yourself with a parking violation or will be towed. 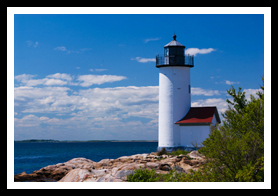 In addition to its lobstering and harbor tours, they provide a special Cape Ann Lighthouse Cruise all along Cape Ann that covers six area lighthouses.